Ijiro is a robot which expresses emotions reacting to a user’s actions. 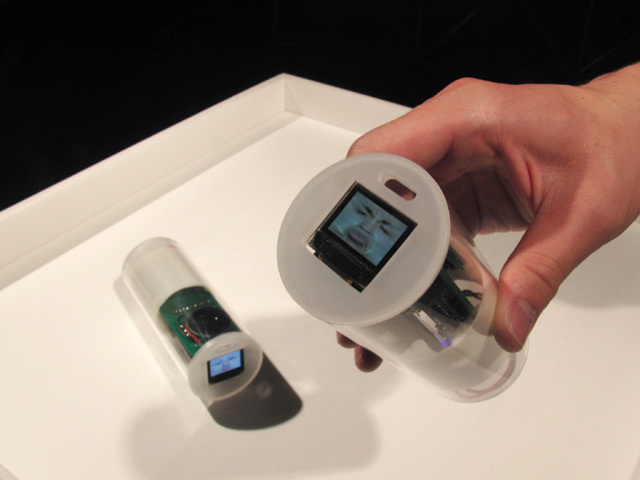 Boldly, it consists of an OLED display, a speaker and an accelerometer in a cylinder shell. Ijiro isn’t able to move itself because it doesn’t have any actuators. However, it expresses emotions with faces in the display and voice from the speaker when a user touches it, lying, standing, swinging, hanging and so on. For example, if a user swings it softly, it reacts smiling. But if a user swings it roughly, it reacts angrily. So those reactions let users feel it like a baby. It is actually baby’s emotions characterized by cognitive science. Also, Ijiro’s shape is designed as a cylinder. It is considered to get various user’s actions because only a cylinder can be stood, lied down, rolled and so on in primitive shapes. Recently it has been easier to use electronic parts for arts. One advantage of making art pieces with compact electronics like a cell phone. So the art style is able to change from being viewed in a large room to being anywhere. Ijiro was developed to entertain people to keep it like a physical pet. We hope you all enjoy touching it. Yujiro Kabutoya and Kazushi Mukaiyama is a group that makes a communication robot in Future University Hakodate. Mukaiyama is an associate professor of this school and Kabutoya is a system engineer who graduated in his lab. They work in research for natural communication and interaction between man and machines.